Where to find Glendive hotels near an airport? Where can I find hotels in Glendive that are near tourist attractions? Are you after accommodation in downtown Glendive? Within a 0.1-kilometre (0.06-mile) radius of central Glendive you'll find 9 Expedia-listed short-stay and long-stay accommodation options you can choose from. While Glendive can't lay claim to having a wide selection of hotels and apartments close to its city center, Riverside Inn should be close enough to please most visitors. The Super 8 Glendive is nicely located 4 kilometres (3 miles) away from the central part of Glendive and is excellent for travelers who like to save money wherever possible. The Days Inn Glendive is another no-frills hotel in Glendive. 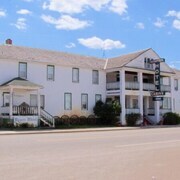 The Astoria Hotel and Suites is positioned 4 kilometres (3 miles) away from the center of Glendive. 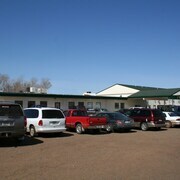 Another accommodation option is the Comfort Inn Glendive, which is positioned 4 kilometres (3 miles) away. The Yellowstone River Inn and the Oak Tree Inn Glendive are some alternative Expedia-listed accommodation options around Glendive. Why don't you take the time to investigate the other attractions dotted around Eastern Montana while you are in the area? Eastern Montana is marked by prairies, and commonly visited Eastern Montana attractions include farms. In this part of United States of America travelers might try their hand at shore fishing and camping. The MonDak Heritage Center is a popular destination here. Find accommodation in Sidney, which is 80 kilometres (51 miles) to the northeast of central Glendive. 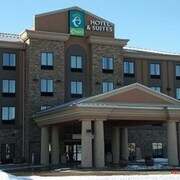 Make a selection from the Holiday Inn Express Hotel & Suites Sidney and Richland Inn & Suites. Glendive features some terrific scenic and cultural attractions; discover more at Expedia's informative Glendive travel guide. What are the most popular Glendive hotels? 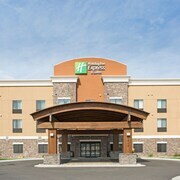 Are there hotels in other cities near Glendive? 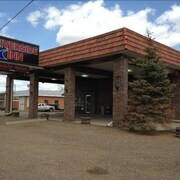 What other types of accommodations are available in Glendive? Explore Glendive with Expedia.ca’s Travel Guides to find the best flights, cars, holiday packages and more!